last night at 3:30am i was startled to hear somebody come into the office. seconds seemed like hours as i waited for whoever it was to show himself. michael! he came in early so that he could leave around noontime. i finally went to bed at 5:30am, slept in the storage room, my ritualistic night time reading material was a book about an american spy in the kgb. i had to go to bed with earplugs because the storage room also housed the servers, and i couldn't fall asleep with the loud humming of the server fans. i woke up around 8am when the office lights were turned on (somebody must have gotten into work, other than michael) and i was bathed in bright flourescent illumination coming from the ceiling. i turned over so i wouldn't directly face the lights and went back to sleep. i finally woke up for good at 8:40am, went downstairs to take a shower, and then came back up, sat at my desk, and proceded to work again. i had worked 20 hours the night before and slept for 3 hours. when michael saw me he mentioned with a smile that "that wasn't enough sleep!" how true. so that's how my day started. this is my second time having slept in the office. it feels totally weird, you see the next work day in a completely new perspective. everything seemed new, everything seemed different. you notice things you've never noticed before. heighten sense of awareness? i'm not sure what it is. it just feels weird, that's all. only after having spent a night sleeping over at the office can you truly understand. i wouldn't recommend it though. given the choice, i'd go home and sleep in my bed for even just a few hours rather than sleep in the office. there's a certain sad state about somebody who sleeps in the office because of work reasons. it means you're a total slave of the company, at least that's how i feel. well, this slave is slaving no more! an explanation on that later. for my lunch time break, amanda and i went to the petco pet store across the street from the galleria mall, or as i fondly like to call it, the "poor man's zoo." we saw lizards and frogs and scorpions and giant millipedes (i'm actually tempted to buy one, $20) and various fishes and small furry animals and their feathered friends. afterwards, we went to boca grande to buy a burrito for carrie and then hopped to the kendall house of pizza where amanda got the meatless sub while i got one of my regular sandwiches, the small steak tips sub. amanda sort of gave me the eye when she heard what i was planning to get. "don't you always regret it, getting the steak tips sub?" "no," i replied. (an hour later, after consuming my sandwich, i was regretting it - too much!). i also bought a bottle of jolt, the 2x caffeinated cola. if it was going to be a long night, better jack up my body with massive dosages of caffeine! walking back to the office we bumped into carrie who was standing by the curb next to a car that appeared to be hers. she came out to put more quarters into the parking meter but discovered one of her tires was completely flat (flat like the hub was touching the ground). on top of that, to make matters worse, she also got a $10 parking ticket! this, after she got her car towed yesterday and had to pay $50 to bail out her vehicle! times like this makes me appreciate being a t rider. i never have to find parking space for my bus nor get my subway train towed for leaving it illegally parked somewhere. now this is where my day gets turned upside down on its head. at the end of the regular work day (4-5pm), i finally reached my breaking point. i'm actually quite surprised it took this long. i think many other people would've broken down a long time ago. having spent the night at the office and not getting enough sleep, not being able to open my eyes fully and having an exhausted mien permanently etched into my face, having worked exactly 100 hours for this week (starting on friday, ending today at 5pm on thursday), and then suddenly bombarded with multiple bug fixes on top of my current programming work, i just lost it. i couldn't do anymore work, i was angry, i was tired, i was completely finished. i just stared at my monitor, letting my legs dangle and swing underneath my seat, sort of humming to myself. i think maybe dan might've noticed something and from his office all the way across the room, he asked how i was doing. "fine" i said. "fine" is my euphemism this week for everything that isn't fine. after a few minutes of fuming, i was able to isolate one outstanding bug problem, so that made me feel a little better, and i started to focus again. it was going to be a long night, john and i would probably be working late, it'd be my second day of sleeping in the office. i was ready to work. it was going to be painful, but my life had already been ruined by work, another night, another day, wasn't going to make much of a difference. then i got a phone call from john. i immediately thought, "oh no, more bug fixes," and the disgruntledness sort of started to bubble once again, but turned out john was calling me to tell me to stop working and go home. what? stop working? go home? two alien phrases i know not the meanings of. long story short, given that we only had one more night before delivery, and that everyone on the team had been stretched to our limits with massive late nights and very little sleep, it didn't seem feasible that a delivery could be made, so better to stop everything and reassess the schedule instead of continuing forward sort of drifting aimlessly towards a potential disaster. did that make sense? sorry for being so vague, but right now i don't quite understand it myself. it's like suddenly all these past three weeks of pressure has been lifted from my shoulders. true, the project continues, but we're not working weekends and we're not working late nights. my life appeared to be returning to normal. so what if i don't get compensated? a return to my mundane work schedule has become reward in itself. so sad, but so true. i feel like a death row inmate who's just been granted a stay of execution. sure, i'm going to get execute eventually, but not tonight, not tomorrow, not this weekend. me and my nihilistic analogies. you really can't be expecting all happy thoughts at this stage of the game. humorous aside: prior to leaving the office for the night, a spontaneous "food fight" consisting of foam balls erupted downstairs between john, amanda, and myself. amanda first throw hit me in my sweet spot as my knees immediately unbuckled and i landed on my side in a wee bit of pain. apparently the fact that i got smacked in the nuts didn't deter the ball fight, as i continued to be pummeled with projectiles even after my shouts of "time out!" and "game over!" as i was lying on the ground contemplating the meaning of life, i thought to myself with a pained smile, "if i have to be struck in my sensitive region in order to leave work at a sensible hour, i'd totally take the hit." john and i left the office for a bar/restaurant called courtside on cambridge street, within walking distance from work. cast of tonight's thursday night drinkfest characters included julie (with her new canon g1), david woog, david cronin, klea, elias, kristen, rebecca, tunde, roy, jared, and jared's gf katie. tonight was karaoke night, and the capstone to this evening was john miller's delightful rendition of fiddler on the roof's "if i were a rich man." brought the house down! at least from our camp. 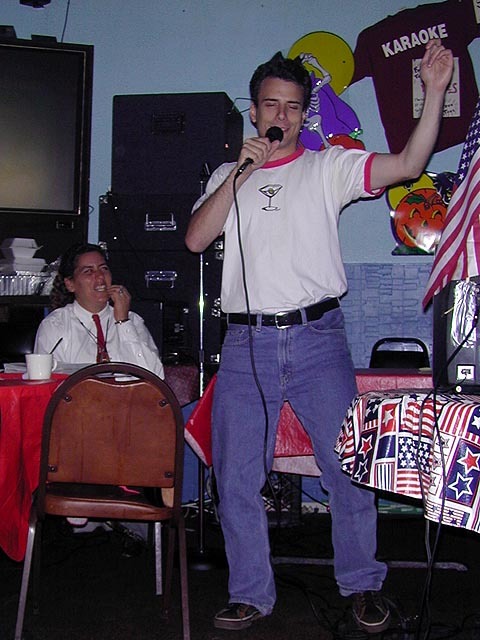 after it was over, the dj remarked that this was the very first time anyone has ever karaoked to that song before. john and i left the gathering early though, 9pm, before julie and klea got to do their duet. when we left, they had yet to pick the song from the binder full of titles. my personal recommendation was prince's "u got the look." hopefully somebody was able to catch this moment with julie's g1 set to video mode.